It was frustrating that the two matches on the schedule that I really wanted to see started at exactly the same time. In the end, I missed Alize Cornet v Alison Riske on Court 1 and watched Belinda Bencic and Mona Barthel on Centre. I’m a fan of both Mona and Belinda so it had to be done! Overall, I quite enjoyed this match. I felt that Barthel was the better player for large chunks of the match, but Bencic was mentally stronger. Bencic was consistent, but a little passive in the first set. It was mostly about Barthel who hit some beautiful winners but also, many shanks. She hit shanks into opposite stands (! ), one was caught by a lady halfway up on the East stand. After an exchange of breaks, the first set went with serve. Belinda cranked it up a notch at 4-4 with some high quality play. She struggled to close out the set and slammed a ball when Barthel saved a set point on a lucky net cord. Barthel hit three superb returns in this game, but Bencic just about held on. Other than that, I was surprised how calm Bencic was! Barthel kept up the great returning in the second set and coupled with controlled and aggressive baseline hitting, took control. She went up 5-2* in the second set and looked to have the set in the bag… Oh Mona! Returning at 5-3 she got to 30-30 with a stunning volley and then had a set point. However, there was a noticeable switching of the momentum baton. Bencic stepped up her intensity and you kind of felt Mona feel it too. Bencic played some of her best tennis of the match to break back and break to lead in the second set with a number of clinical passing shots. I expected Belinda to serve it out, but surprisingly, she lost her intensity and played a flat game. Mona missed a few break points on sloppy return errors but eventually broke to force the tiebreak. I couldn’t quite make sense of all the change-ups in momentum! Barthel went up 6-3 in the tiebreak with back-to-back aces. On one of the next points, she didn’t commit to a ball she thought was long but was easily in. At 6-6, it was Belinda’s mental toughness that got her the win. Mona played some solid tennis though considering her recent wrist injuries. I really like Mona, she seems very sweet. I loved the handshake! At first, I thought Barthel was refusing to shake hands but they had a laugh about something. I think Mona was apologising for something. Mona and Belinda are great! 🙂 They’re both in my top ten of favourite players. 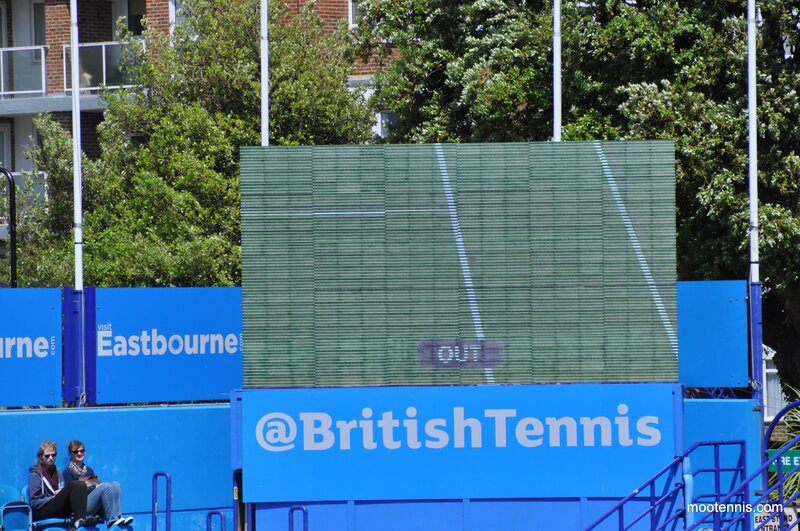 Random point – This match made history as it was the first ever match in Eastbourne to have Hawkeye! They used it for this match, but strangely not Gavrilova v Erakovic. Oh I love Mona! She really does have an awesome game, I just hope she strings it together one of these days. Many thanks for the write up and great action shots James!